Temporomandibular joint (TMJ) syndrome or TMJ joint disorders are medical problems related to the jaw joint. The TMJ connects the lower jaw (mandible) to the skull (temporal bone) in front of the ear. Certain facial muscles control chewing. Problems in this area can cause head and neck pain, a jaw that is locked in position or difficult to open, problems biting, and popping sounds when you bite. The TMJ is comprised of muscles, blood vessels, nerves, and bones. You have two TMJs, one on each side of your jaw. The disk acts as a shock absorber between the bones in the neck. In cervical disk degeneration (which typically occurs in people age 40 years and older), the normal gelatin-like center of the disk degenerates and the space between the vertebrae narrows. As the disk space narrows, added stress is applied to the joints of the spine causing further wear and degenerative disease. The cervical disk may also protrude and put pressure on the spinal cord or nerve roots when the rim of the disk weakens. This is known as a herniated cervical disk. Chiropractic can be an effective choice for the relief of headache pain. Chiropractors have treated headaches throughout the 112 plus year old profession. Duke University did a literature review for several different treatment options for headaches and also found positive results for chiropractic in the treatment of headaches.The researchers found that chiropractic adjustments of the cervical spine resulted in IMMEDIATE improvement in headache severity for cervicogenic headaches. We know of no other approach that can have this fast an effect. 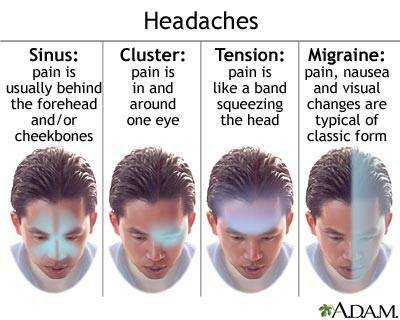 Cervicogenic headaches are headaches that originate in the neck (cervical area of the spine).